The recipe I ended up with is nothing like the ones I got in college. This muffin is actually a rather healthy muffin–they contain no refined sugar, there is no oil, and I use only whole grains. 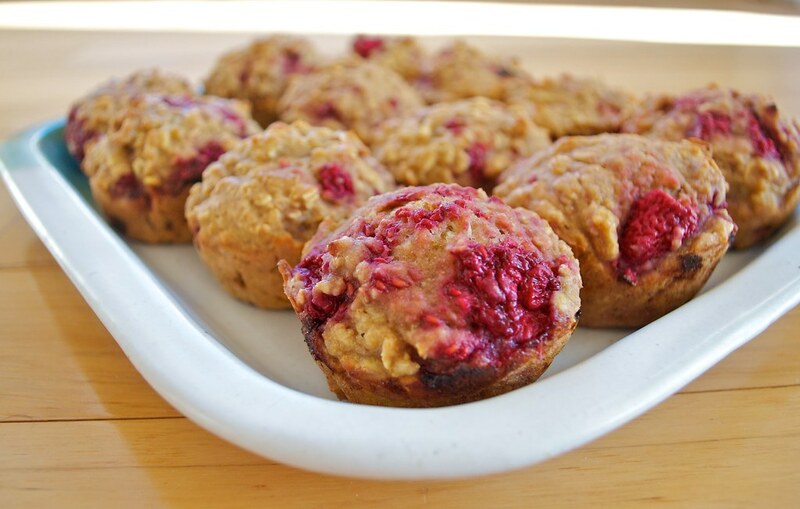 The sweetness of the muffin comes from the juice that the oats are soaked in, the fruit pulp that is used in place of oil and egg, and of course the raspberries themselves. Of course this means that my recipe is nothing like your traditional muffin, but you can eat these essentially guilt free (which is always a plus!). I hesitate to call the muffins a dessert, unless your sweet tooth is on a very low setting, but I imagine with a glaze of some kind these could make a good stand in. 2. Add the banana pulp (or applesauce, if using) and mix. 3. Mix in the salt, baking powder, baking soda, cinnamon, and nutmeg. 4. Add the flour and stir until just mixed. 6. Fill muffin tins, about 3/4 full (a little extra is okay), and bake until lightly browned, about 20 minutes. 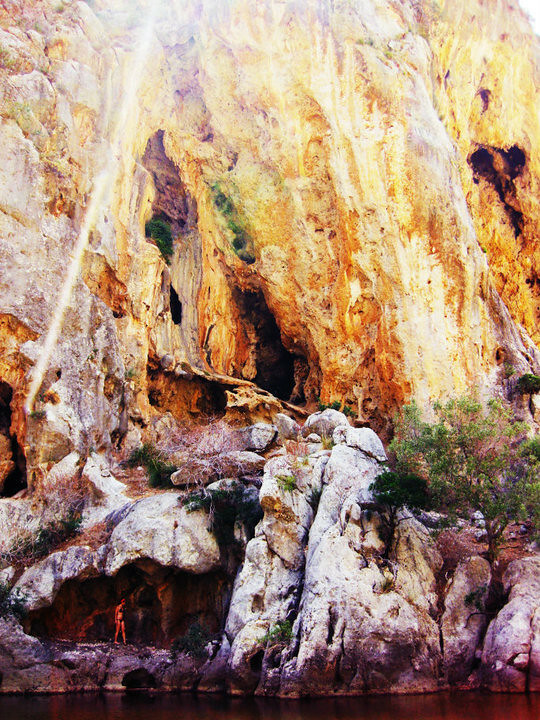 On another, completely unrelated note: here is a taste of my recent trip to Spain with my little sister! It’s like a Where’s Waldo game–can you find me? This entry was posted in bread, breakfast, dessert and tagged low-fat, muffin, oatmeal, raspberries, recipe, vegan, whole grain. Bookmark the permalink. I loved those muffins, too! We’ll have to get some at reunion. these look amazing! i love raspberry muffins! These look great… I am always in search of recipes which are without sugar and not much oil… I would like to give them a go … Can they be made into a whole cake as well… just wondering… ? I do believe this batter is best suited to muffins, I tried to make it in a loaf pan once, and it took forever to bake and even then parts were still a bit gooey. It’s a thick batter and because there is no oil (or egg) which recipes normally depend on for leavening. I have since stuck to making the muffins. If you try the cake let me know how it turns out, but I have a feeling you’d run into similar problems that I had with the loaf pan (though possibly not as bad because cakes are less deep than loaves). I just tried it as a cake with half the ingredients in an rectangular pan about 8 to 9inches… at 180c in a fan oven… took about 25 min and even then it was not cooked from inside… it was all gooey from inside !! Thanks for the feedback. I think we can conclude that it is best to make muffins with this particular recipe. Possibly adding some oil and a flax “egg” or two would make it better for baking as a cake. The problem is it’s a thick batter that doesn’t rely on traditional leaveners so baking evenly in a larger shape becomes problematic. I’m sorry the cake didn’t work out for you! Try these again in muffin form. 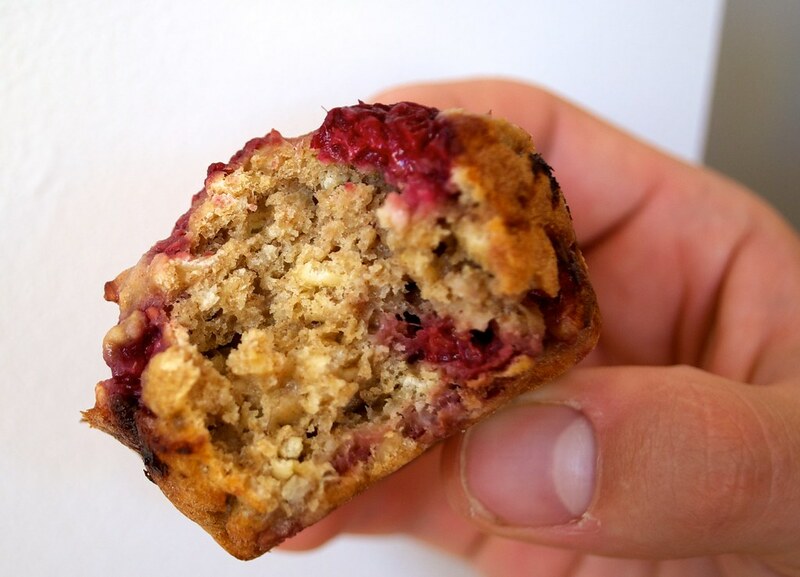 As you can see from the picture showing the inside of the muffin, these bake beautifully as muffins! Instant vs. rolled oats shouldn’t make a huge difference, though the cinnamon and sugar might have changed the taste a bit. I did a caloire count on these wonderful muffins and they are approx 93 calories per muffin. I got 22 muffins from my batter. THey are really good in all ways!!! Hi! 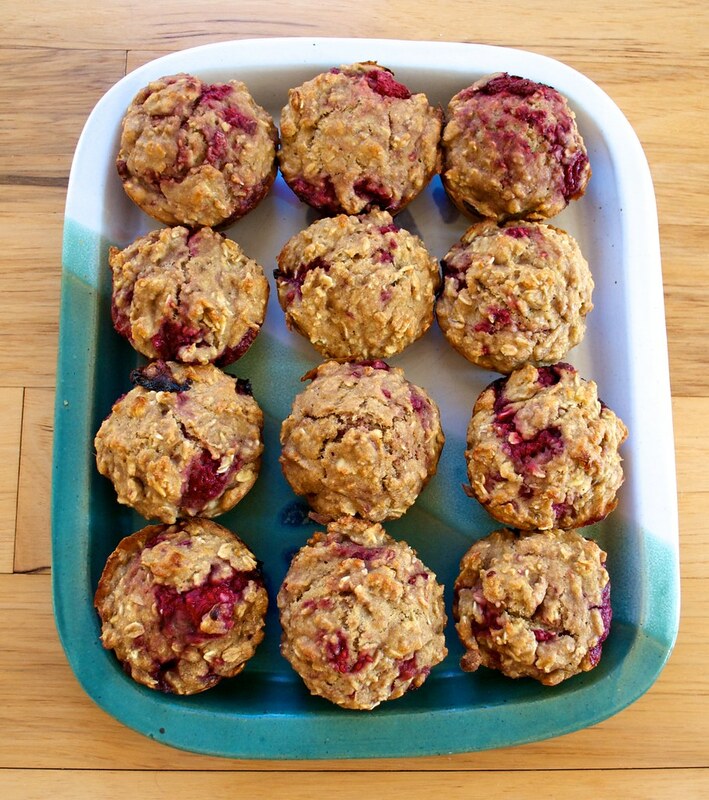 I couldn’t believe that I found such handsome muffins made without added sugar, fat, or egg! I made them with a mix of 1 cup halved blackberries and 1 cup chopped fresh seasonal peaches. They turned out super well, and I highly recommend this combo! The recipe makes a lot of batter; I made 24 medium muffins, and poured the remainder into a 9″ pie plate. Re: baking time for a layer of muffin batter … the muffins took about 25 minutes and the pie round took about 40 minutes. Only the area directly touching the fruit pieces was still moist at that point. These muffins don’t seem to burn, so feel free to keep them in if you’re unsure and check with a toothpick every 2-3 minutes. Definitely a keeper! Thank you for the muffins. I hope they turn out well, Going in the oven. I baked this these weekend for a friend who is vegan and I AM HOOKED…these are amazing!!! I used strawberries instead of raspberries because it’s what I had…definitely a keeper (like Natasha said)! I don’t have any juice right now. So you think it would work to sub rice milk for the juice? Has anyone tried that? I wouldn’t recommend it, the juice is where the sweetness comes from in the muffin. If you use another liquid you’ll want to add a sweetener (like sugar) of some kind and since I’ve never made it that way I can’t say what amount you’d need. I made these today with my boyfriend and we loved them! They are super easy to make and clean up was a breeze! They taste great and I added some powder sugar on top because I am taking them to a christmas eve party and this made them look festive! I am totally going to try another fruit next time! I followed the recipe exactly (using OJ instead of applesauce) but thought the muffins turned out fairly bitter and didn’t have any sweetness. Perhaps I did something wrong, but I triple checked the recipe and couldn’t find anything that I had left out. Did anyone else have this issue? My batter turned out really thick and the muffins were tough. I did use gluten free flour…I wonder if that has anything to do with it? I had a similar problem: I used spelt flour in stead of regular flour and (fairly sweet) apple juice in stead of orange juice. I’m from Holland, so I only used 3 tsp baking powder (we don’t really use baking soda here). Maybe that’s why they didn’t rise though? The taste was delicious by the way, so thanks for the recipe! I do want to try baking them again and actually make them rise this time though… Suggestions are welcome! I have done a lot of baking and these have got to be the most disgusting muffins I have ever tasted. Would never make them again. Those muffins were the perfect treat on the way to an Italian class I had in the library. I made these today for my girlfriend and she is now a convert to what she formerly thought was a “weird” flavor combo. Though definitely different from the original, they are a nice little taste of mohome- thanks for posting! i just made a raspberry coffee cake similar to these except it was vegetarian because of the yogurt and milk. I love recipes with no egg and minimal sugars.Thanks for the inspiration! I plan on making these for my son to take to preschool on his snack day. I am so tired of hearing about the “pudding” and “cookies” and there sugary crap that parents bring in! About how many does this recipe make? Do you think this recipe would work with dried cranberries? I usually have these on hand. What adjustments should I make? Hi Starlette! I think that would be delicious if you rehydrated them. I’ve done this with dried cherries before. Here are the instructions: http://noshon.it/tips/how-to-rehydrate-dried-fruit/. I did not like these muffins, they were like raw clumps that mostly stuck to my muffin papers. I followed the recipe right to the T, and they were bad. I guess to each our own. I cannot find whole wheat pastry flour. What can I replace it with? You mentioned whatever combo of white/wheat flour, but does it have to be pastry flour?